BPM, needle drop, time remaining in song, key lock, and which deck you are on. Which DJ software does the Mixtrack Platinum come shipped with? The Numark Mixtrack Platinum comes shipped with Serato DJ Intro. 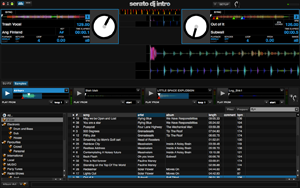 As an option, users can also use Serato DJ 1.7.5 and up with their Mixtrack Platinum. Please note, these can be upgraded to Serato DJ through additional purchase or previously activation. What are the size of the platters for the Mixtrack Platinum? The Numark Mixtrack Platinum platters are identical to the Numark NV platters in terms of size. They are 5-inch intelligently-responsive metal platters with search and scratch modes. Utilizing exclusive Numark technology, these capacitive, touch-sensitive jog wheels control the audio when the wheel is touched and moved. The autosensing technology continually adapts to environmental conditions ensure consistent reliable performance. No other brand of controller can match this technology. When the Wheel button is not active, use the jog wheel to bend the pitch of the track. When the Wheel button is active, use the jog wheel to grab and move the audio, "scratching" the track as you would with a vinyl record. You can also grab the non-touch-sensitive outer wheel to bend the pitch of the track. What does the Touch Strip do on the Mixtrack Platinum? What do the filter knobs do on the Mixtrack Platinum? How long are the pitch sliders on the Mixtrack Platinum? The pitch sliders are 100mm (most competitors are 60mm only). Does the Mixtrack Platinum have LED meters? Yes, the Mixtrack Platinum features ultra-bright LED volume meters. Can I scratch on these 5-inch platters? The Mixtrack Platinum is made out of high impact polymer composite which provides strength and durability as well as making it lightweight. How do you change the pads modes on the Mixtrack Platinum? No. The Mixtrack Platinum is a class compliant device so there are no additional drivers to install. The DJ controller is both Mac and PC supported. Since Mixtrack Platinum’s hardware controls appear to your computer as a generic MIDI device, it can indeed be custom-mapped to any other DJ application that supports user or developer-created custom mapping.